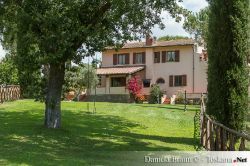 The farmhouse Valgattolina is situated in the Province of Grosseto, in Southern Tuscany, within the so called Maremma. The property consists of three holiday apartments surrounded by 6 ha land made of a park, olive groves and vines, within the valley of the river Alma. In only a few minutes by car it is possible to reach Follonica (9 km), characterized by a never ending beach, the elegant Punta Ala (8 km) with yacht harbour, or Castiglione della Pescaia (11 km) with a medieval fortress, a small town that knew how to preserve the characteristics of a fishing village. Exactly in this part of the coast, from Follonica towards South, with beaches like the enchanting bay Cala Violina (8 km), the beach of Punta Ala and Le Rocchette outside of Castiglione della Pescaia have been classified one of the 5 most beautiful and clean coasts in Italy. Here, the white sand, the crystal-clear water and lush vegetation promise a relaxing holiday. Also for those who are fond of nature, history, arts and culture or the gastronomy there are numerous opportunities. The whole region around is covered with Etruscan necropolis. The most important ones can be visited at Vetulonia (Tomba del Diavolino and Tumolo Etrusco della Pietrera) or Roselle. Russellae, as it was once called by the Etruscans, was part of the Etruscan confederation, before it was destroyed in 294 B.C. by the Romans. The antique boundary walls, dating back to the 6th century, are still in existence. 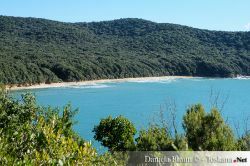 About 20 km towards South from the Agriturismo Valgattolina, at Principina a Mare starts the Parco Naturale delle Maremma, which stretches until reaching Talamone. Within the park it is possible to take part in guided excursions, during which it is possible to discover a still wild and uncontaminated nature, as well as animals threatened by extinction. Following always towards South, one meets the Monte Argentario with the characteristic Porto Santo Stefano (Ferry to the Island of Giglio) and the elegant yacht harbour of Porto Ercole. Once, the Monte Argentario (translated literally "Silver Mount") was an island and as a result of an accumulation process of detritus that were transported by the rivers and the sea currents, the island was connected through the sand-dunes with the coast, creating the lagoon of Orbetello. 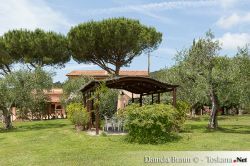 Towards North is situated the antique village Populonia, overlooking the beautiful Gulf of Baratti. From the 9th century B.C. on, Pupluna, as it was called, was an Etruscan settlement. The iron extracted on the Island of Elba, as well as the copper and the bronze coming from the colline metallifere (engl. metalliferous hills) were processed in this place. Only a few kilometres north, is located the port of Piombino (about 40 minutes by car from Agriturismo Valgattolina) from where it is possible to reach the Island of Elba. 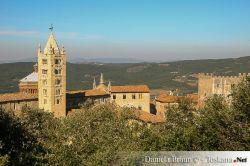 Also the near inland offers serveral places worth seeing: about 25 km away Massa Marittima, defined as the Pearl of the Middle Ages (it. Gemma del medioevo), which already during the Etruscan and Roman times was renowned because of its mineral abundance. Lots of history, arts and gastronomy invite for a visit. Only 15 km from the farmhouse away lies the picturesque village of Scarlino, dominated by the medieval castle. A little bit farer away is located Saturnia (80 km) with the famous thermal springs, already exploited by the Romans. Nearby three picturesque villages built on a tufa rock: Pitigliano (white wine Bianco di Pitigliano), Sorano and Sovana. Also worth visiting is the near Scansano, famous for the red wine Morellino di Scansano. 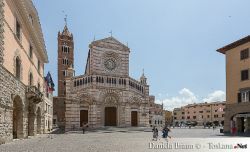 The most important Tuscan towns of art and culture like Florence (190 km), Pisa (160 km), Siena (100 km), Volterra (120 km) and San Gimignano (95 km) are reachable between 1 or 2 hours by car. Agriturismo Valgattolina offers a relaxing holiday between the enchanting hills of the Tuscan Maremma and the marvellous coast.